And the hits keep coming from Aaron Crow. Last night, he pitched a scoreless eight inning in a tie game, striking out 1 and allowing 1 hit, keeping his season (and career) ERA at 0.00. RHP Aaron Crow, who struck out Orioles 3B Mark Reynolds to lead off the eighth inning Tuesday, has retired the first batter he has faced in all 13 of his appearances. 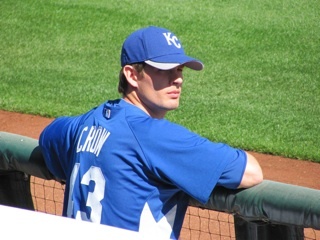 Crow has not allowed a run in 15 1/3 innings to start his big-league career. If you play fantasy baseball and can use the value of a good relief pitcher in the Starting Pitcher spot of your lineup, you should go get Aaron Crow. He is currently owned in 1% of ESPN leagues and 11% of Yahoo leagues. At least no-one can say we are perfidious towards SP/RP's, which is nice.